Cut out strips of your tissue paper atleast 2 inches wide. 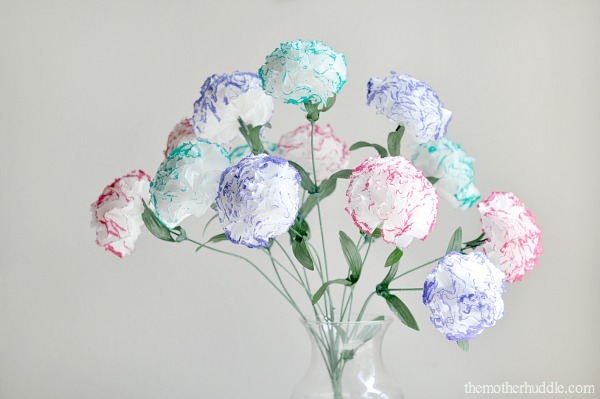 I have used square tissue papers not the rolled ones here for my tissue paper rose flowers. I cut them out into 4 long strips, one strip for one tissue paper rose flower. 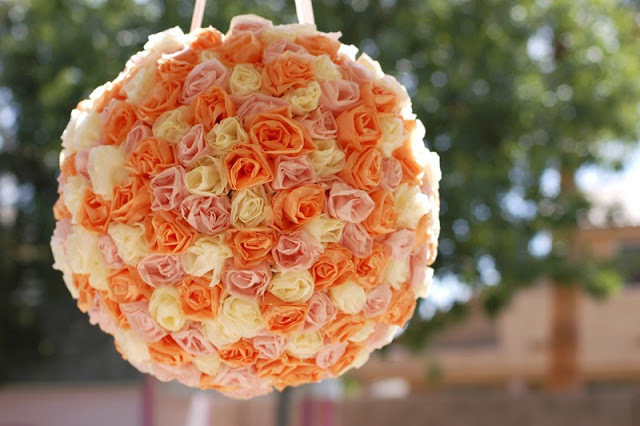 Next is the simple trick in making beautiful tissue paper rose flower. Separate all your strips and crush them nicely. When you open them out they must be soft and flowey like cloth. Carefully open your crushed strips. I have used two strips one over the other to give my tissue paper rose flower a fuller look since i know my strip length is lesser. You are now ready to start with your flower. Make a small triangle at the corner by folding the strip and start rolling the strip from thereon till you reach the end of the folded part. Make sure that you dont leave the end of the strip around which you are rolling right now. Once you are near to the end of your triangle fold, fold the strip outward again to make a triangle and start rolling. The idea is to keep rolling the strip by folding it over and over again in the outward direction. The simple trick in getting the best rose is to leave little frils in every triangle fold while rolling so that your flower doesnt end up like a tight roll. Once you have finished with your strip, bring the end to the strip end that you have been rolling upon til now. Secure both the ends by twisting a wire around. Carefully roll a green tape around the wire and the tissue paper ends and secure tightly. Tada!!! 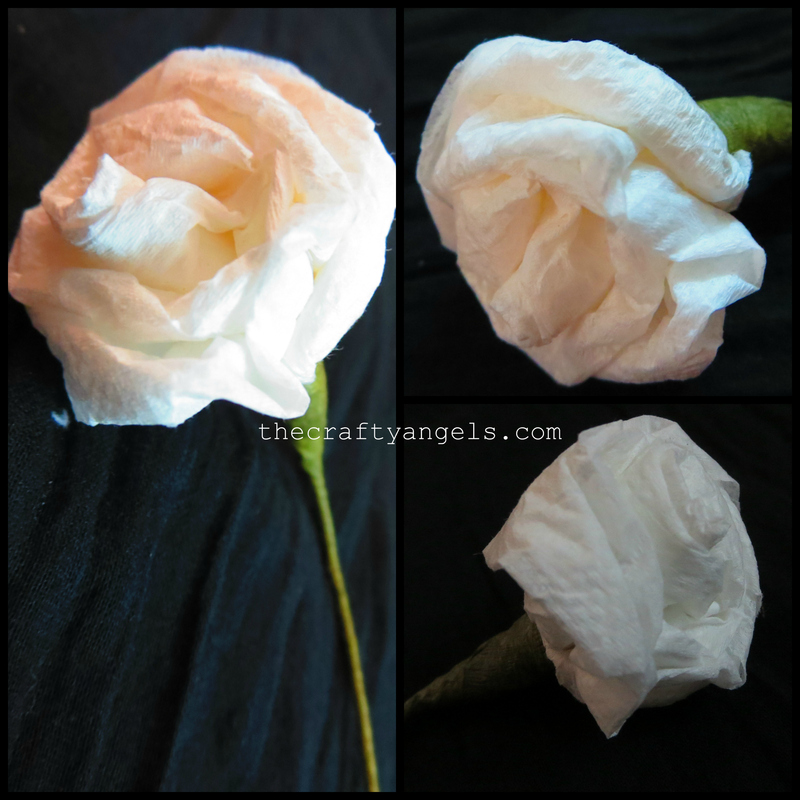 you have a beautiful tissue paper rose flower in your hands in just 2 minutes! First and most importantly CRUSH crush and crush the tissue paper before starting off else your petals will have broken cracked edges rather than being round and curved. 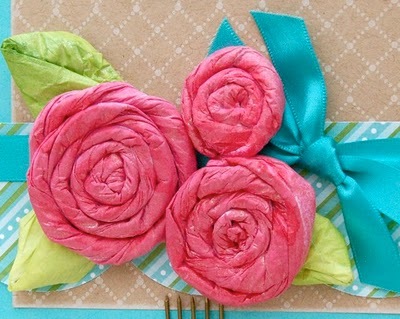 Try including small frills in between so that the tissue paper rose flower doesn’t end up as a tight roll of paper. P.S. Linking to Itsy Bitsy online challenge – Anything but cards! super do i want to be folding like triangle till i reach end?i am waiting for the answer please.